Register at HighPulseRakeback.com and use all benefits of unique Reward System. It integrates rakeback, signup bonuses and affiliate money in one brilliant, fair and transparent stroke. If you play poker yourself or sign-up new players you will get good rewards. But if you do both you will receive serious money. Level 2 – Your affiliates (Players who signed up at HPP using your code). Level 3 – Affiliates of your Affiliates (Players who signed up at HPP using codes of Level 2 affiliates). The first and the most important thing at HPP is your Affiliate Step. Your Affiliate Step is determined by Total amount of Step Points you have. The higher your Affiliate step is the more rewards you get. Here is a table showing how Total Step points affect your rewards. Example: If you have 100 Total Step Points you are at Affiliate Step 4 and you will receive 40% personal rakeback, + 20% of your affiliates’ rake, + 10% of Level 3 affiliates’ rake and so on. How Step Points are calculated? Step Points show your activity and activity of your players at HPP. The more you play the more Step Points you get. The more players you invite the more Step Points you get. 1 Euro of Rake is equal to 1 Step Point. These extra step points will be added to your own points and will help you to get more money from our Reward System. 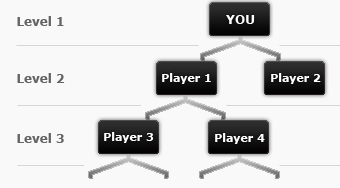 To reach Affiliate step 5 and get 50% rakeback without affiliates will be difficult for a small player. But if you invite your friends it will be much easier. NOTE: All rakeback and Step Points calculations are made automatically by the poker room. You will not have to calculate anything. You can always find latest information about your income at the special section in “Account and Settings”. Information about your income and step points is updated every 30 minutes. Examples below are shown for your information. Hope the examples will help you to understand the system better. Imagine that you play poker and have multilevel Affiliate network. In the end of a week your total rake is €200. You have Level 2 affiliates. They raked in €600. You also have Level 3 and Level 4 affiliates. They raked in €600 and €400 correspondingly. You want to calculate your income. You remember that Affiliate Step determines your income. To find out your Affiliate Step you must calculate Total amount of your Step Points. In the table above you rake in €200 and receive 200 SP. Players from Affiliate Level 2 rake in €600 and you receive 600 x 0.5 = 300 extra SP and so on. After calculations for each level you know that you have received 500 extra SP from youe affiliates. Total SP = Your SP + Extra SP. 200 + 500 = 700 Total Step Points. You see that in example above you will receive 50% rakeback and extra €250 from your affiliates. Your total income will be €350. Now you know how to calculate your income. In real situation you will not have to calculate anything. Your income will be calculated automatically. Join our unique Reward system. Just create an account using this Guide.